"Education is the most powerful weapon with which you can change the world." Proper health and education are the fundamental factors in the development of children. In rural Honduras, six out of ten children never have the opportunity to learn past the sixth grade. Why? In a country where over 25% of the population is unemployed (the actual number is much higher in Intibucá), transportation, books, basic supplies, and required uniforms are very difficult for parents to afford. For many children who do attend secondary school (grades seven through nine), these barriers are difficult to overcome. As a result, schooling ends for the majority of children after sixth grade, leaving them with little chance of advancement beyond low-paying manual jobs. Shoulder to Shoulder is working to break the multi-generational cycle of poverty by contributing to the education of hundreds of Honduran children. For more than a decade, we have successfully administered a scholarship program for the neediest children in one of the most remote areas of Honduras – children who are both motivated and committed to continuing their education. The local Hombro a Hombro board of each community carefully selects each recipient based on need and commitment. 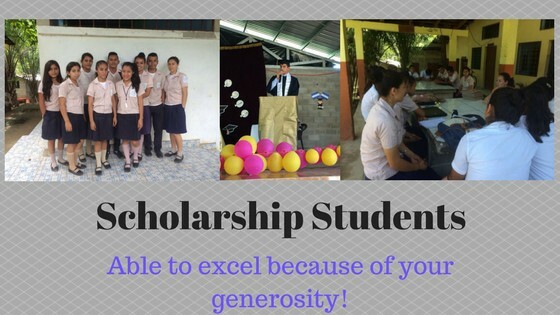 Continuing scholarships are contingent on the students’ academic performance. Sponsored students meet with our local education coordinator throughout the year and participate in a peer support group. They receive academic guidance and opportunities outside the classroom, such as tutoring, motivational speakers, learning effective studying techniques, and attending self-esteem workshops. Each year, almost 150 high school students receive the gift of a scholarship. Each sponsored student receives school supplies, uniforms, and shoes. When school is too far away to walk each day, we provide funds for transportation and/or housing. These might not seem like important items — but, without them, many of these children would drop out of school. This program would not be possible without your support. For $20 a month, or $250 annually, your donation provides a child with an entire years’ worth of education, including books, supplies, transportation, uniforms, housing, and after-school support. Gifts of less than $250 are combined to provide as many full scholarships as possible. Help change a child’s life today.